From the Contract Menu, click on Settings -> Advertiser Portal. Status: Wether you want to allow the advertiser to pause / unpause the contract. Schedule: Wether you want the advertiser to manage their own schedule. Caps: Wether you want the advertiser to manage their own caps. 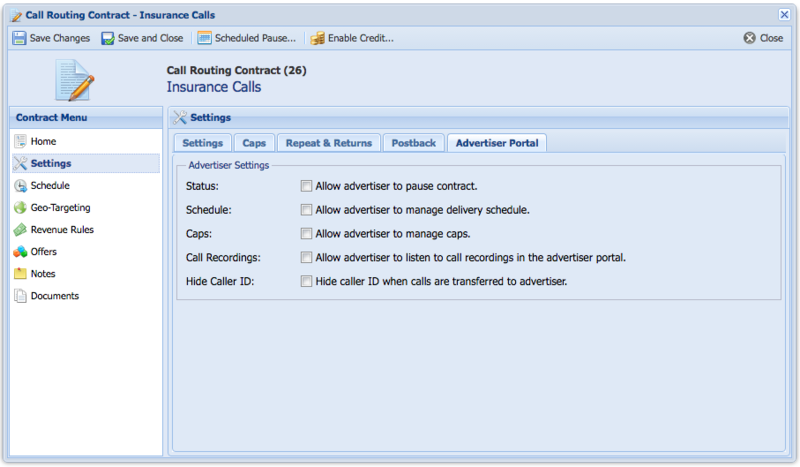 Call Recordings: Wether you want to allow the advertiser to listen to call recordings. Hide Caller ID: Hide Caller ID from the Advertiser, The caller ID will be masked with the Tracking Number.